Thinking, Fast and Slow is a best-selling 2011 book by Nobel Memorial Prize in Economics winner Daniel Kahneman which summarizes research that he conducted over decades, often in collaboration with Amos Tversky. It covers all three phases of his career: his early days working on cognitive biases, his work on prospect theory, and his later work on happiness. The book's central thesis is a dichotomy between two modes of thought: "System 1" is fast, instinctive and emotional; "System 2" is slower, more deliberative, and more logical. The book delineates cognitive biases associated with each type of thinking, starting with Kahneman's own research on loss aversion. From framing choices to people's tendency to substitute an easy-to-answer question for one that is harder, the book highlights several decades of academic research to suggest that people place too much confidence in human judgment. Why talk about this book on this blog? Because it can explain, through the lens of Kahneman's research, biases in our thinking and understanding of extreme weather, flooding and climate change. 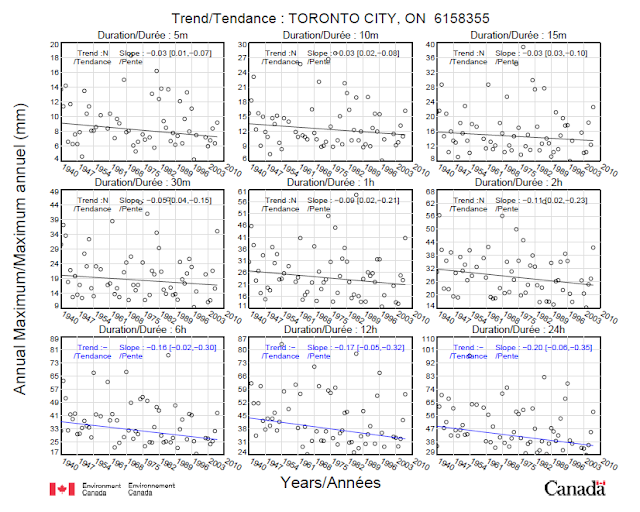 Exposure to temperature trend data anchors decision making on rainfall trends. Exposure to trend data on annual rainfall (e.g., frequency of days with precipitation during a year) anchors decision making on frequency of short duration rainfall events that cause flooding - this is despite the fact that days with precipitation represents even minuscule 'trace' rainfall events (< 0.5 mm depth) while flood events typically require 100 times that threshold of rain (e.g., 50 mm depth). 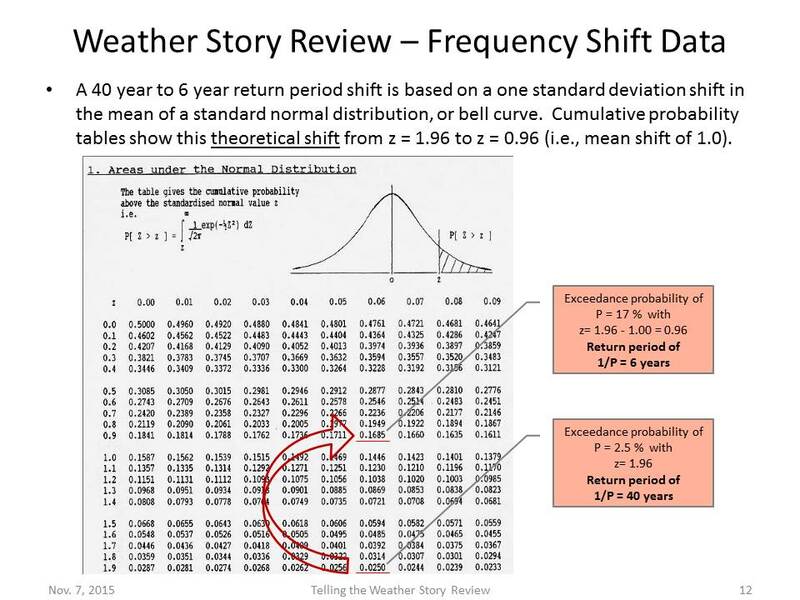 Having weather personalities report that after extreme storms we had more than a month's rain in x hours, for example, anchors the public's perception about the frequency, or rarity, of the event when in fact a statistical evaluation of rainfall extremes would show that exceeding average summer monthly rainfall totals is not rare. For example, after the July 8, 2013 storm in Toronto, where 126.0 mm of rainfall was recorded at Pearson Airport, the National Post reported "Before Monday, the highest rainfall ever experienced in Toronto for July 8 was 29.2 mm set in 2008 — a record that was more than tripled". Tripling records sounds extreme when referred to a particular calendar day and anchors perception of rarity - but calendar days statistics are irrelevant given that summer convective storms are uncommon and 2/3 of July days are dry - furthermore daily totals of a similar magnitude were recorded twice before in 1980 and 1954 (119.9 mm and 137.4 mm respectively), and the previous July 8 record was exceeded by 200% in 7 other years between 1950 and 2013. Headlines or course try to emphasize the rarity of events, not the commonplace. 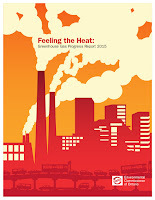 In presenting Insurance Bureau of Canada and Institute for Catastrophic Loss Reduction's "Telling the Weather Story" to the Empire Club in 2012 (YouTube) Dr. McBean first presents trends on temperature and discusses them for five minutes showing undeniable trends in warming, and warming rate - this anchors listeners. 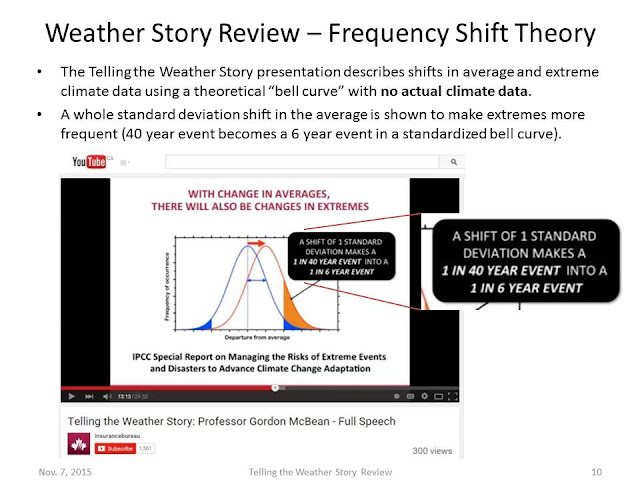 He then switches to rainfall but shows no data, and instead only a theoretical bell curve frequency shift (see 13:10 in the video), but then concludes storm frequency is increasing as well. 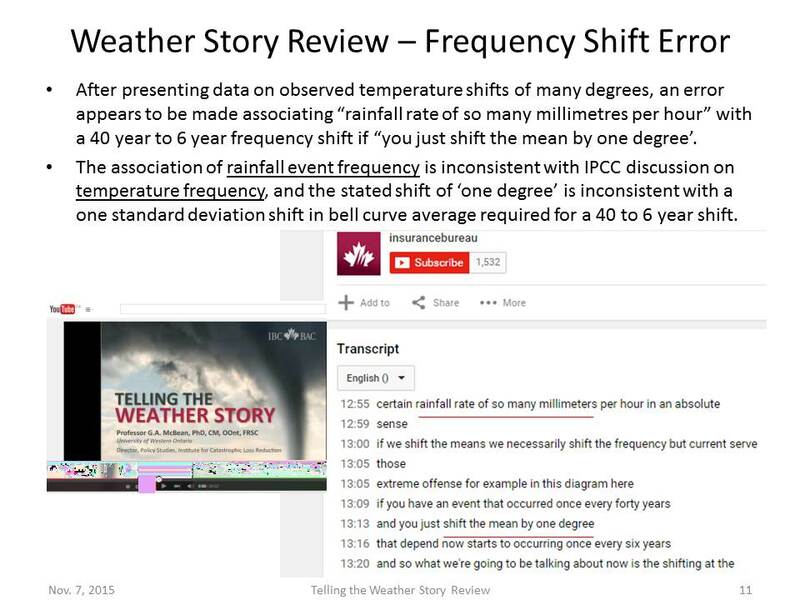 The listeners' cognitive bias due to anchoring on temperature will allow them to readily accept rainfall increases as facts as well, as opposed to recognizing rainfall increases as theoretical speculation as fully explored in this blog post and slide deck and in fact confirmed by Environment Canada and the CBC in response to inaccurate reporting. The availability heuristic is a mental shortcut that occurs when people make judgments about the probability of events by how easy it is to think of examples. In the context of extreme rainfall, 24-hour weather broadcasting, and 24-hour new channels give the public many example of flooding events that skew the perceived probability of occurrence. Hurricane Katrina and Hurricane Sandy are examples of extreme flooding that the public can recall in the context of flooding, but that have little relevance to urban flooding caused by convective thunderstorms. Likewise for Tsunamis. Other types of flood events caused in large part by operational issues and inherent vulnerabilities are recalled and mistakenly associated with extreme rainfall as the sole cause (Union Station flooding June 1, 2012 was due to construction pump bypass capacity specifications, GO Train flooding July 8, 2013 due to rail line vulnerability (being below known moderate frequency flood levels)). stranded GO Train in 2013 in the Don River valley. 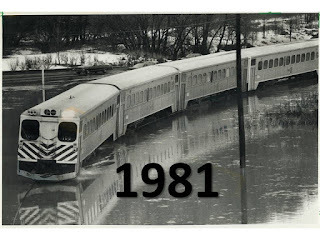 that GO Train rail area flooding occurred on December 25, 1979, January 11, 1980, March 21, 1980, April 14, 1980, February 11, 1981 and May 11, 1981. Under the availability heuristic people tend to heavily weigh their judgments toward more recent information, making new opinions biased toward that latest news. 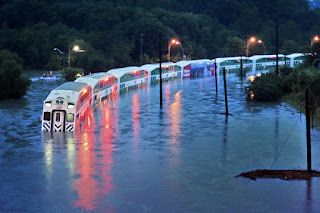 Nobody knows that the May 29, 2013 flood was worse (higher rainfall in East York, higher flow and flood levels at Todmorden gauge near the site) - because the train schedule missed the flood timing! Nobody remembers Ivan Lorant's flood inquiry report for Premier Bill Davis in the early 1980's. Nobody asked the Toronto and Region Conservation Authority if this was a flood prone area and if this extent of flooding was unusual at the GO Train flood site. Nobody asked the Port Authority if the lack of Keating Channel dredging in the past few years contributed to flooding, just like it did in the early 1980's before the inquiry. Attribute substitution is a psychological process thought to underlie a number of cognitive biases and perceptual illusions. It occurs when an individual has to make a judgment that is computationally complex target attribute, and instead substitutes a more easily calculated heuristic attribute. This substitution is thought of as taking place in the automatic intuitive judgment system (System 1), rather than the more self-aware reflective system (System 2). Hence, when someone tries to answer a difficult question, they may actually answer a related but different question, without realizing that a substitution has taken place. This explains why individuals can be unaware of their own biases, and why biases persist even when the subject is made aware of them. flooding processes - a slow, effortful. complex and reliable approach. As rain first causes runoff, which then creates flow, which then causes flooding, it is easy to mistakenly correlate increased flooding to increased rainfall. The alternative is analyzing the complex problems of urban hydrology changes that influence runoff, the stormwater management mitigation measures that can lessen some impacts of some development at some scales, hydraulic interaction in the flow systems including riverine systems (Lisgar District Basement Water Infiltration Assessment is a wonderful example in Mississauga, or Basement Flooding Areas 4 and 5 in Toronto (see page 4 in the Executive Summary on Black Creek interaction)) with the overland, underground separated, combined and partially separated sewers, hydraulic impacts of operational constraints (bypass pumping during construction, inadequate dredging), hydraulic impacts of environmental protection measures (provincial F-5-5 compliance, federal Fisheries Act compliance, etc. ), and hydraulic impacts of development intensification on overland flow routes and interactions with underground systems and private systems. It is much easier to focus only on rainfall. And, conveniently, everyone has an opinion about the weather. 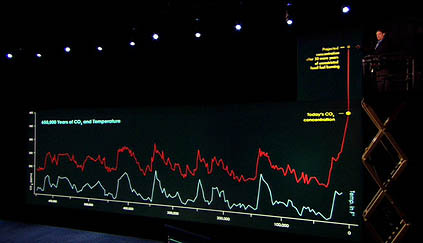 Many prominent organizations and individuals have established a cognitive bias based on temperature trends and have since applied Kahneman's fast and error-prone System 1 thinking approach to rainfall extremes. 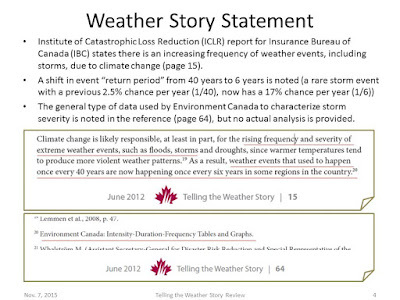 The anchoring bias in media report emphasizes the rarity / frequency of events and ignores past events and other causes (operational or intrinsic vulnerability) of flooding - Environment Canada's extreme rainfall frequency and trend data is ignored. The availability bias of extreme flooding events reported through the media skews the public's perception on the true probability of events - it is very easy to find examples of flooded underpasses because these are designed to lower flood standards, but flood a lawyer's Ferrari in an underpass and it will be ingrained in the public's mind for a long time. 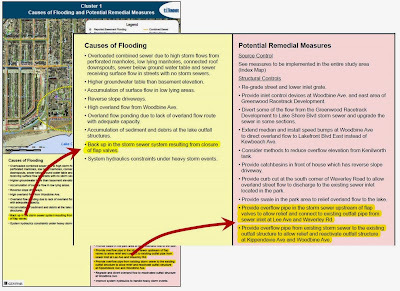 Attribute substitution bias allows the public to simplify and explain flooding with rainfall (rain = flood) as opposed to thinking about the actual complex system (rain = baseline runoff + development runoff +- mitigation measures = flow +- capacity constraints +- operational factors = flooding). Media support attribute substitution by ignoring even the most fundamental physical facts. 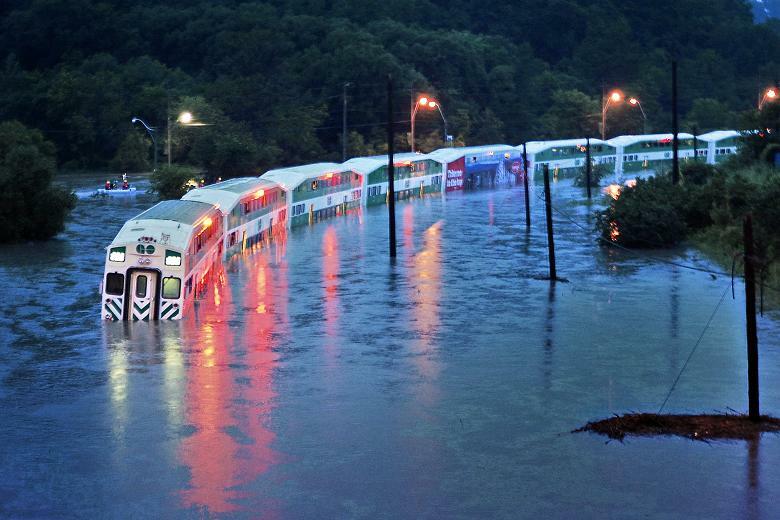 For example, the GO Train flood on July 8, 2013 was cited as a 2013 Top Weather Story by CBC News as they associated the record at Pearson Airport with the flooding (record rain somewhere = flooding somewhere else). 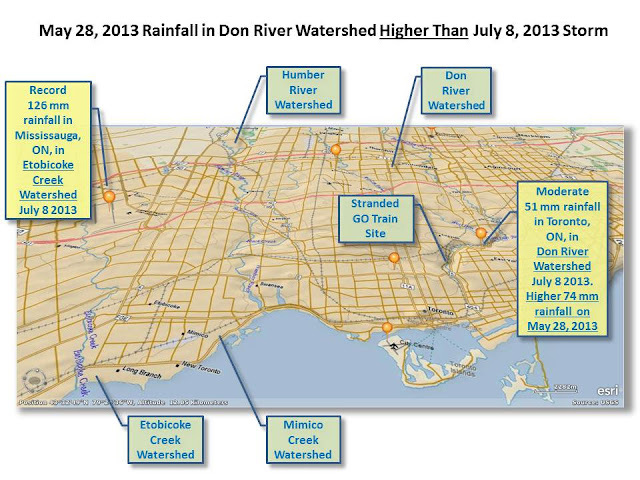 They ignored the fact that Pearson is in the Etobicoke Creek Watershed, three watersheds away from the Don River Watershed where the GO Train flooded - this is basic hydrology: Mississauga rain = runoff in Etobicoke Creek, not in Don River). They ignored that no record rainfall occurred in the Don River Watershed as they were anchored to the Mississauga data 25 km away. System 2 Mode of Thought - Data and Analysis - Slow, Methodical. 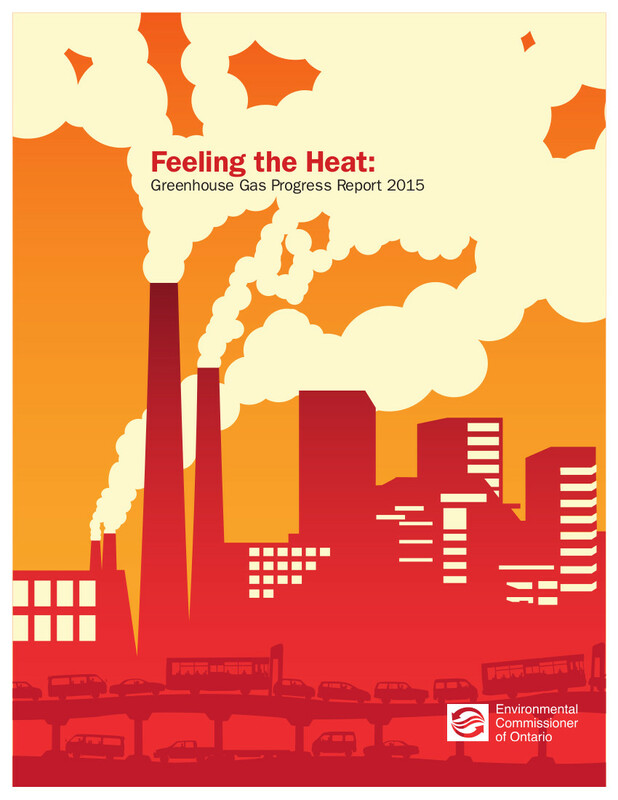 Source: Environment Canada Engineering Climate Datasets ver 2.3. 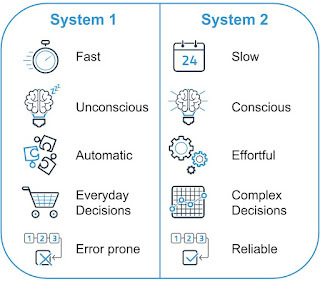 System 1 Mode of Thought - Infographics and Heuristics - Fast, Emotional. 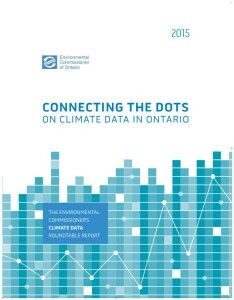 Connecting the Dots on Climate Data in Ontario. 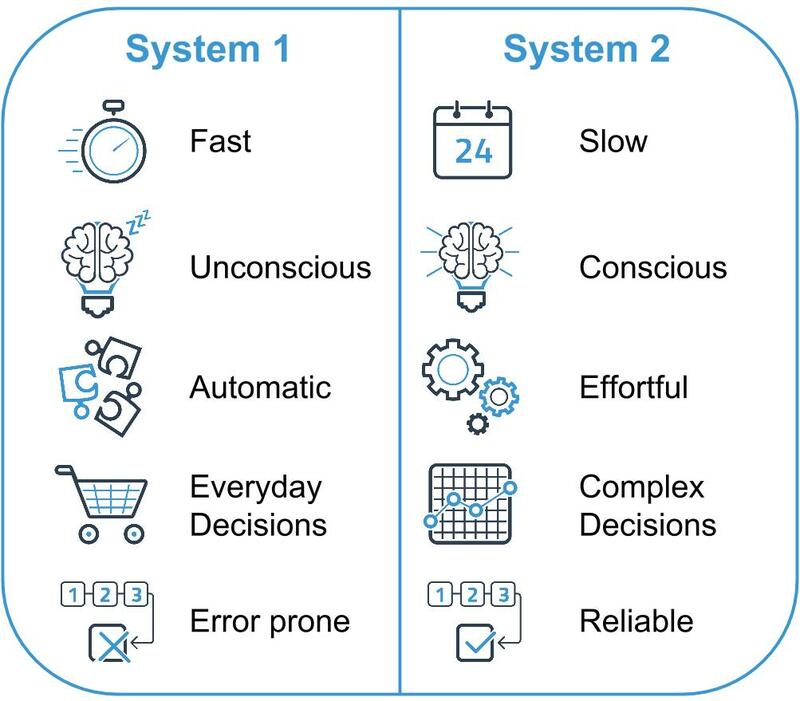 Testing assumptions requires Kahneman's "System 2" thinking - slow, deliberate and logical, as opposed to fast, instinctive and emotional in order to overcome heuristic biases in our thinking. "People are not accustomed to thinking hard, and are often content to trust a plausible judgment that comes to mind." No real change in Canadian rainfall extreme weather. Environment Canada's Engineering Climate Datasets v2.3. It is common (convenient?) 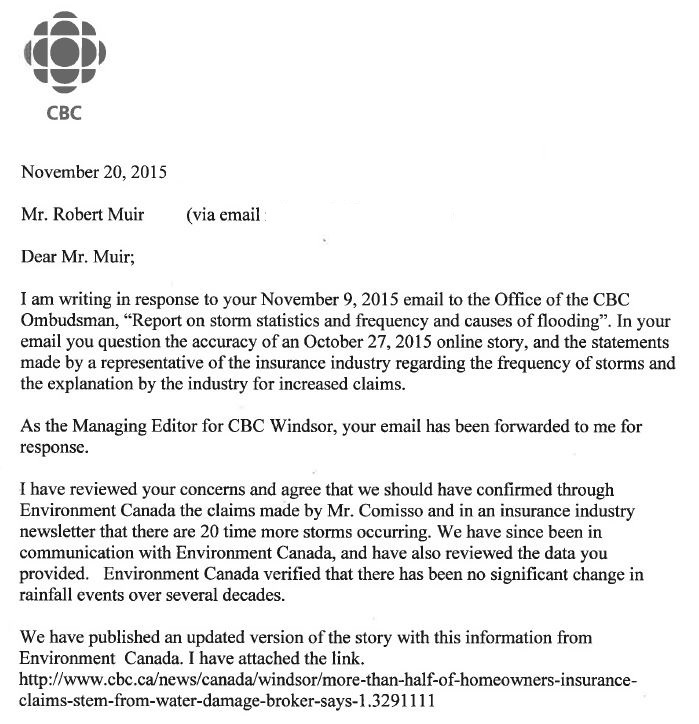 for the insurance industry to explain increased premiums due to storm frequency. 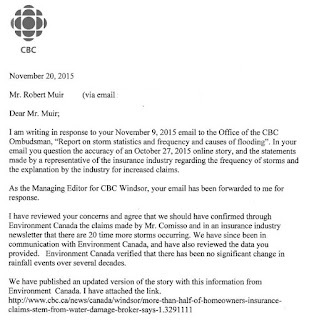 In response to our complaint on inaccurate reporting from an insurance broker's newsletter, the CBC has acknowledged "Environment Canada verified that there has been no significant change in rainfall events over several decades" in a letter to us. People are catching on that we cannot just Blame it on the Rain. So what are the real factors pushing damages and premiums higher? CityFloodMap.Com explores many factors that increase damages and add cost pressures in our letter the the Minister of the Environment and Climate Change. But there are factors beyond the physically obvious watershed hydrology and infrastructure hydraulics. Macro economic factors affecting insurance industry investments are the unspoken factor that puts upward pressure on premiums for property and casualty insurers in Canada. Details are in Facts of the Property and Casualty Insurance Industry in Canada 2015 is published by Insurance Bureau of Canada (IBC). year. The 2013 net underwriting revenue was $648 million. Before 2003, underwriting posted losses for 24 years in a row. On investment, 2013 was a year of relatively low returns of 3.1%. for the last two decades." Sliding investment returns means underwriting has to carry its own weight on insurance company balance sheets. "Some of the challenge we had with the floods in Alberta and in Toronto was this concurrent causation issue, where you had sewer backup happening at the same time as you had clean water flood coming in and you can't really say 'Part of it is brown water, part of it is clear water,'" the RSA representative said. and inflow points enters the 'brown' sanitary sewer. Comment 1) Sewer backup water during severe storms is often brown and clear together, because during extreme storms, the extraneous inflows to the sanitary sewer system dilute the typical brown water, typically by a factor of 10 to 1. For infrastructure managers, the clear water components is often called RDII, or rainfall dependent inflow and infiltration - this clean water component can peak at up to 5 L/s/ha in a partially separated sewer system during an extreme event. Because of this, separating clear water and brown water risks is always difficult to do in practice. exits low lying upstream properties via floor drain. Comment 2) The clear and brown water coming in typically occurs at different locations in the neighbourhood's drainage system. Low-lying areas with low exposed openings can allow clear water to enter buildings and then exits via floor drains. Those extraneous flows enter the sanitary sewer system and cause brown+clear water to enter downstream properties via floor drains. Because of this, a downstream property may be vulnerable to brown water backup, because of an upstream property's clear water risk. clear water creates backup, entering property via floor drain. "In the past, that endorsement was much broader and in some respects would cover flood not intentionally but did cover flood." Comment 3) What this means is that for some insurers, the backup premiums may have been increasing to pay for clear water, overland flood damages. In my case, for example with a different insurer, the premium has increased 800% and the coverage limit has decreased for backup insurance - this could be explained by unintentional coverage of clear water, overland flooding in my city / neighbourhood. In an ideal world, RSA could decrease backup premiums by limiting coverage of uninsured perils like clear water, overland flooding, while pricing clear water flooding separately. .
"If you get Waterproof you get sewer backup and the flood, but if you don't want the Waterproof endorsement, if you don't want the flood, you can just buy limited sewer backup," RSA adds, saying that they are "putting a lot of emphasis" on training brokers. Comment 4) This approach may meet RSA goals of limiting coverage for uninsured perils and increasing premiums for flood to help cover increasing costs during extreme events. In the end, the bottom line for the business is not dependent on having an optimal, precise vulnerability assessment for individual properties - all it needs is a sub-optimal net positive outcome on the portfolio. RSA is making an incremental adjustment toward a more sustainable, better priced risk model with the changes. RSA noted that for high risk properties, it would be difficult to cover fresh water flooding "because there is almost a guarantee that something is going to happen," she added. Comment 5) High risk properties can include those in a defined river floodplains. It is reasonable approach that coverage is not available and instead land use policies should deter such high risk developments over time. What is missing in this approach is that governments and their agencies (Conservation Authorities in Ontario) and insurance companies are not managing all risks in a complete and comprehensive way. Will RSA risk zones be shared with municipalities, or with property owners to support land use planning policies or flood proofing efforts by individuals or businesses? Not likely. Or will the sole purpose of the risk maps be to make decisions on the portfolio for the benefit of shareholders - that is likely - there is nothing wrong with that, but if so, let's take a step back and consider what the insurance industry's role really is in terms of managing society's flood risks. 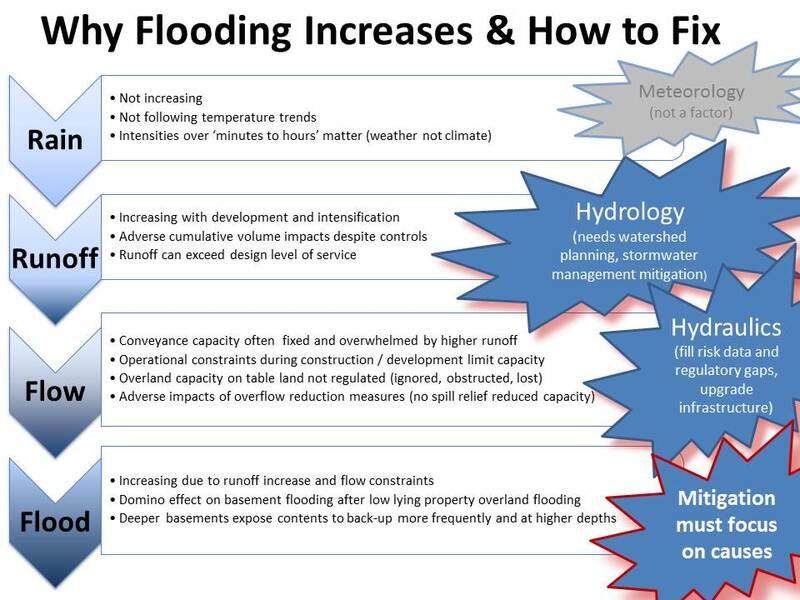 Are the efforts by RSA to define flood risk a benefit to society or the balance sheet? 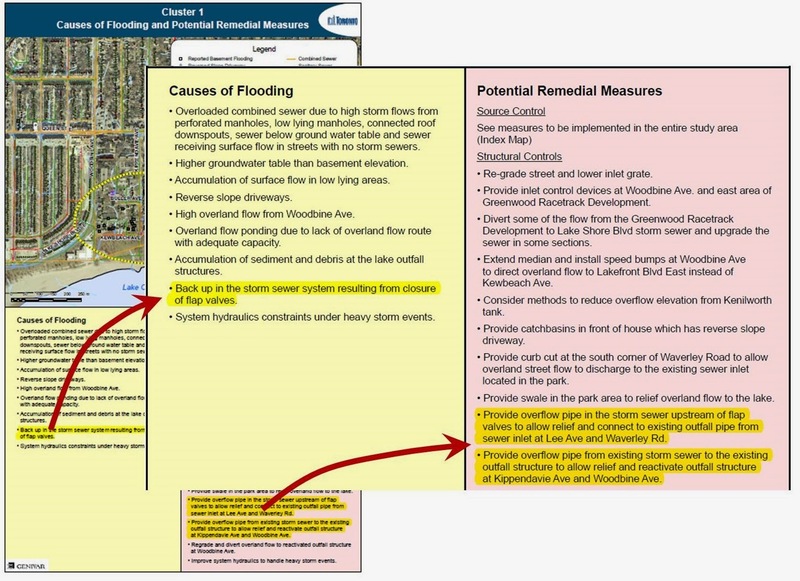 Does it make sense that individual insurers redo overland flood risk assessments independently from each other, or should a public flood underwriter make those assessments to be shared by the insurance industry and municipalities? 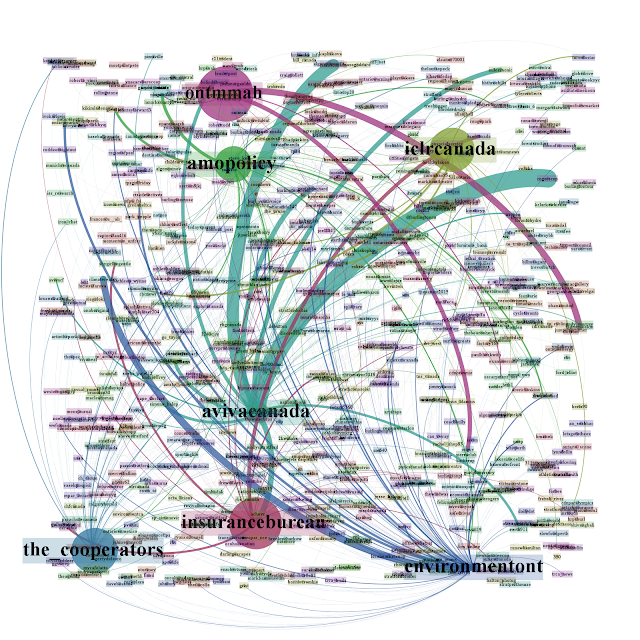 In that manner, there would be no gaps in coverage and risk mitigation strategy. Comment 6) What is needed to enhance the RSA sub-optimal, incremental improvement to risk pricing for flooding during extreme storms? The answer is a more robust, neighbourhood scale vulnerability model and a comprehensive approach to riverine flood risk. This could result in and mandatory coverage for highest risk overland flood properties as one outcome. Similarly, premiums for backup coverage could be increased in neighbourhoods with high overland flood risk, because clear water entering a few properties and overwhelm the sanitary sewer system in a widespread area. Our research shows how overland flood and backup (basement) flood risks are correlated in this post. Because risks are at a neighbourhood scale and policies are written at a property scale there is no way that the current insurance model can be optimal. RSA notes in the article that "Canada doesn't have a lot of high risk zones with respect to flood." Comment 7) In making this statement RSA should have distinguished between urban overland flash flooding and riverine flooding in a valley systems. Certainly a low percentage of properties are within vulnerable valley flood plain areas where rivers and creeks can swell. But on table land, urban flash flooding affects many neighbourhoods built before improved 1980's drainage standard improvements. These table land areas are where 'concurrent causation' really occurs. Lastly RSA notes "That is going to be very clearly defined as what's covered and not covered"
Comment 8) Costs and revenue may be in a more sustainable balance with the RSA policy updates, but this may not necessarily be because policy coverage is more 'clear' in the future. As noted in the initial comments, there will generally always be some 'brown' mixed into the system when it comes to extreme storms. 1) Phat beat with that Roland TR-808 groove in the back of the mix with tasty cowbell tinkles - who doesn't need more cowbell from an iconic analog beat box? 3) High production promotion with a couple of 'singers' delivering it all. 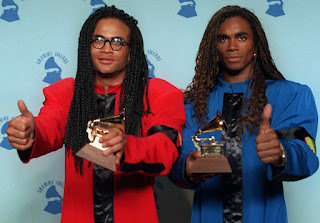 As we all know now, the 'singers' we all saw weren't singing at all, but just lip syncing to recorded tracks telling us to "Blame it on the Rain" because we gotta blame it on something. 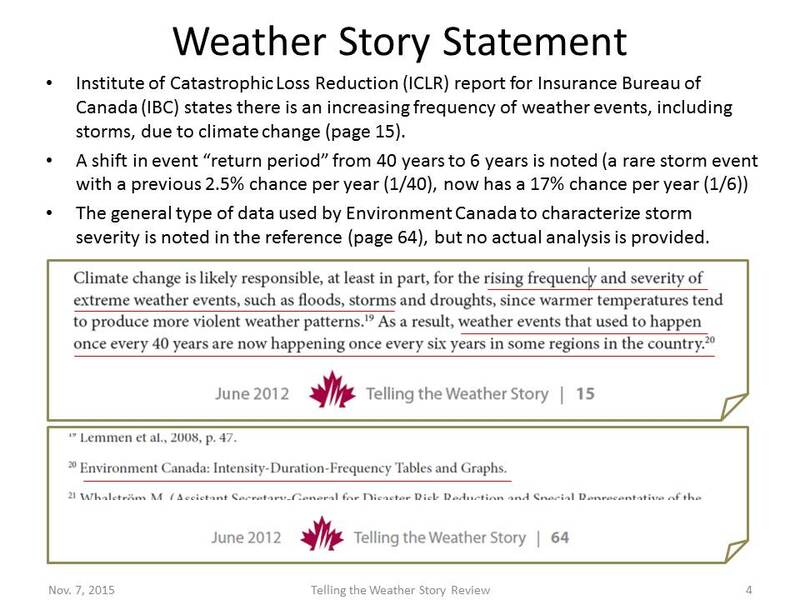 Coles Notes: Environment Canada states there has been no significant change in rainfall over decades. Also old systems built pre-1980's to 1-in-5 year storm level of service will continue to flood as they always have - rain is not more frequent as the data clearly shows. Runoff has increased though in our cities and watersheds. And flow conveyance systems are more constrained resulting in more frequent back-ups and damage. Coles Notes: This GO Train rail line area has always flooded, with records going back to the "Great Flood" on September 13, 1878. But the watershed hydrology has changed and there is more runoff than during the 1981 flood inquiry that noted during the March 21, 1980 flood "Part of the CNR track flooded to the north and east of a point south of Bloor Street." 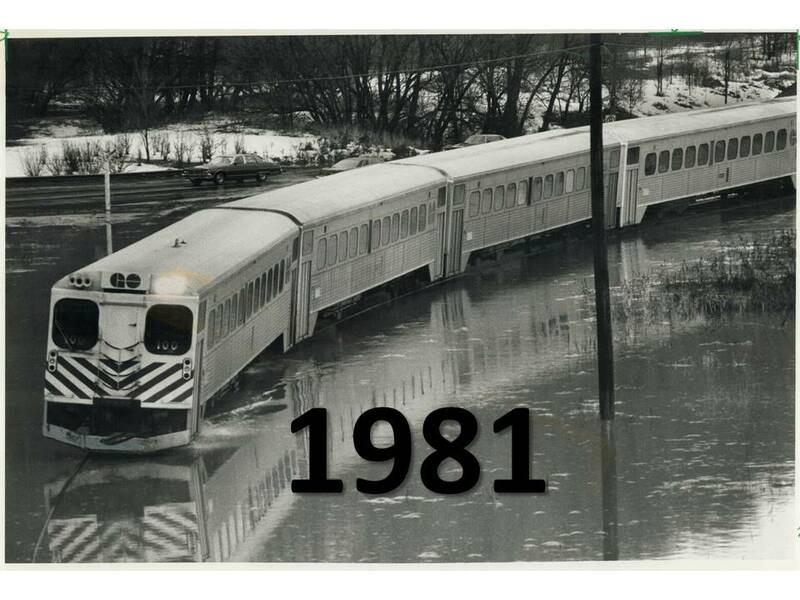 During the April 14, 1980 flood, after a 5-6 hour period of rain, CNR tracks at the Bloor Street ramp were flooded. The inquiry report indicates that train operation has halted, or trains were detoured during floods, including December 25, 1979, January 11, 1980, March 21, 1980, April 14, 1980, February 11, 1981 and May 11, 1981. Lack of recent Keating Channel dredging may reduce flow capacity of the river system, aggravating flood risks. SO DREDGE THE CHANNEL! IT'S LIKE A METAMUCIL FLUSH FOR FLOOD PREVENTION! WAKE UP! The May 29, 2013 flood was worse - higher recorded water level at Todmorden gauge, higher flow rate than July 8, 2013 - but luckily missed trains due to the schedule. Coles Notes: IBC`s report misreports a theoretical normal bell curve shift for temperature changes as actual Environment Canada weather data and then misreports weather to mean extreme rainfall. Overall, instead of blaming it on the rain, look to runoff / hydrology changes in our watersheds and urban catchments, and at flow / hydraulics in drainage infrastructure, including the neglected overland flow system. See the post below on Rain-Runoff-Flow-Flood.